As I mentioned in an earlier post, I seemed to have fallen in love with October. We had perfect weather most of the month, and we had been intentional about enjoying this middle month of fall. It’s my tendency to dread November. I don’t like the time change that brings 4 p.m. sunsets. I don’t like the first brush with cold weather. I don’t like the barren trees and dried up prairie. As October was winding down, I decided to start making a mental list of how I could appreciate November. I thought about our anniversary and my son’s birthday, both in November. I started planning Thanksgiving — my favorite holiday. I planned out my goals for the month. 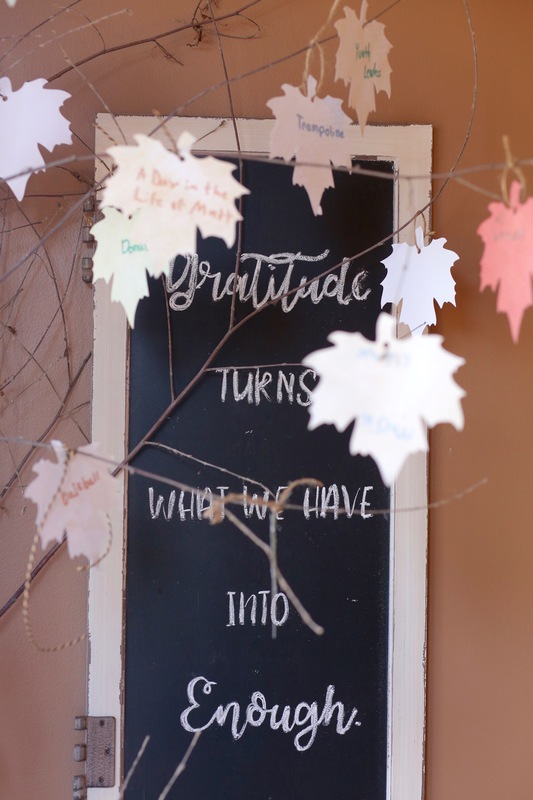 November is all about thankfulness and gratitude, so I wanted to come up with some activities and ideas that centered around that theme. So, last Tuesday, I headed outside with extra enthusiasm before the sun came up to drag a large tree branch out of the yard and into the living room. 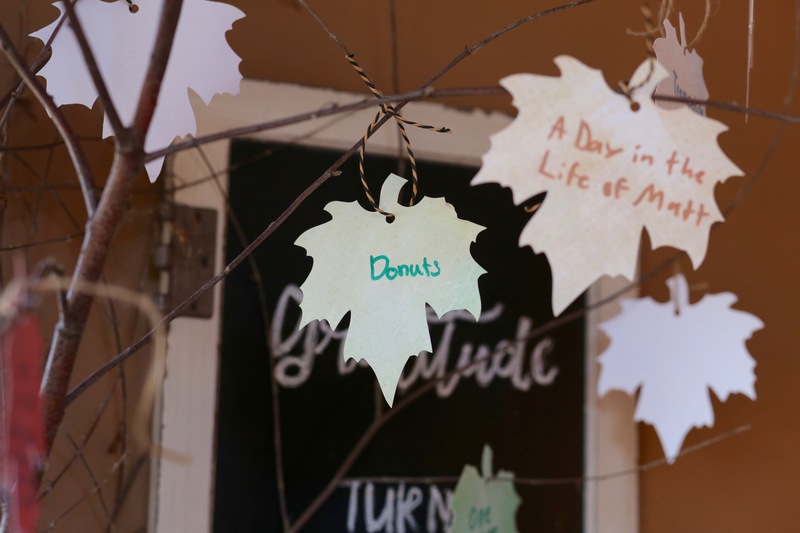 For the past few years, I had seen ideas to make a Thankful Tree. I wanted to do it, but I couldn’t think of a way to do something that would fit in with my decor. 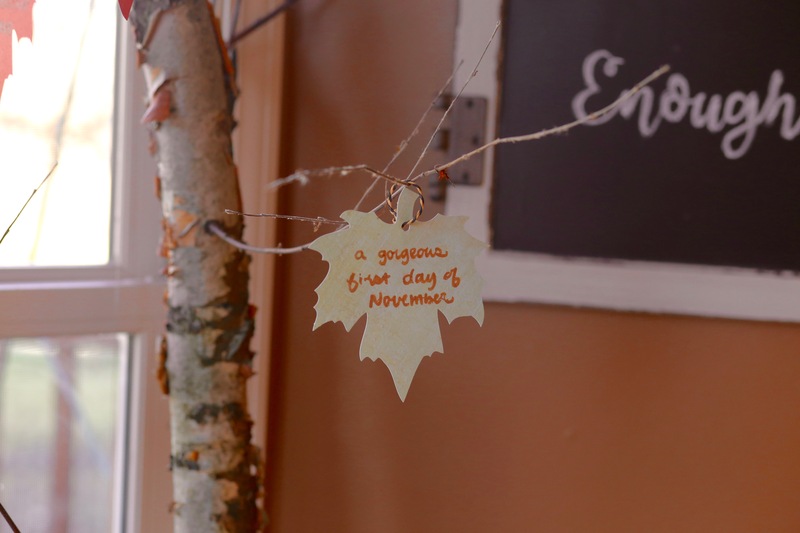 This year, I remembered the large branch my husband had cut from our River Birch tree. It had been laying in the yard since summer. I pulled off all of the old dry leaves and brought it inside. I had just dropped it on the living room floor, when one of my kids came down to deliver some discouraging news. I hadn’t even been awake for an hour, and this news seemed to drain me of my excitement and enthusiasm. I was feeling frustrated, defeated and angry. 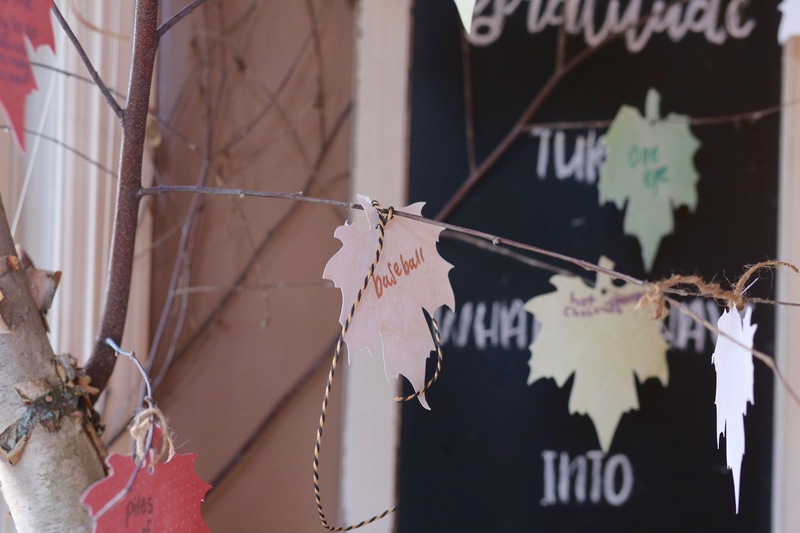 How could I possibly create a Thankful Tree now? I didn’t feel the least bit thankful. I was annoyed. Why do you even get sucked into these dumb Pinterest ideas? It’s ridiculous to drag a huge branch into the living room! What are you trying to do? I left the branch there, and dealt with the problem of the morning. Then, it was time to walk my youngest to school. I stepped out into the beauty of that day and took deep breaths of the crisp autumn air. The sun was shining brightly, and the sky was bright blue. You couldn’t have asked for a more perfect first day of November. When I got back home, I collected myself and figured out how I could “plant” that branch in a big metal container with potting soil. I added large rocks at the top and covered those with the many colorful leaves we had found outside. I found some sparkly cardstock in fall colors and cut out leaves with my Silhouette. I actually felt better after I put it on the tree. That evening, I didn’t deliver a big speech to my family about thankfulness. We didn’t do a Bible study or read a poem. I knew that creating this monument to thankfulness was my thing. I was the one who wanted to practice gratitude this month. I couldn’t force it upon someone else. It was up to them to decide whether to play along. I simply asked everyone if they could write something they are thankful for on one of the leaves. They did it without making a peep. “Wow!” I thought. No one complained. No one asked why. No one acted like I was crazy. They just did it. During the past week, it’s been fun to see people interact with the tree. Some family members fill in a leaf almost every day without being asked. For others, it’s something they do when reminded at dinnertime. We all get excited to see what others wrote. I think that’s actually the best part. I love seeing the little things we all are taking the time to appreciate. Sometimes, they are serious. Sometimes, they are funny. I’ve also realized we all have very similar handwriting so it’s hard to determine who wrote what. After seven days, I thought I might start running out of things to write on the leaves. In fact, the opposite it true. As I think of things to be thankful for, more and more things come to mind. It’s almost like a thankfulness bank has been opened in my mind. 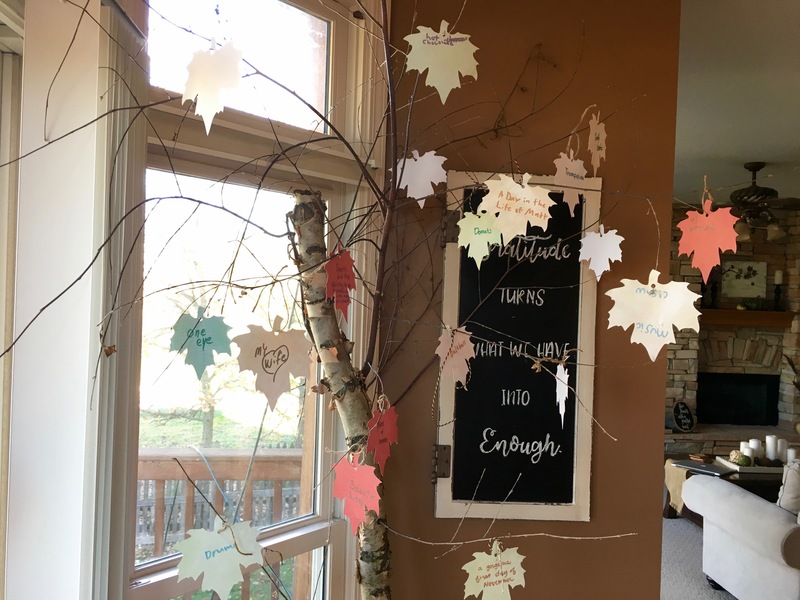 Our Thankful Tree is getting fuller and fuller by the day. Out the window just beyond, we have been watching the leaves fall off of the big Maple in our backyard. Meanwhile, we keep adding leaves to the branch in our kitchen. Yes, the days are getting shorter. The evenings are getting darker. And the air will soon get colder. 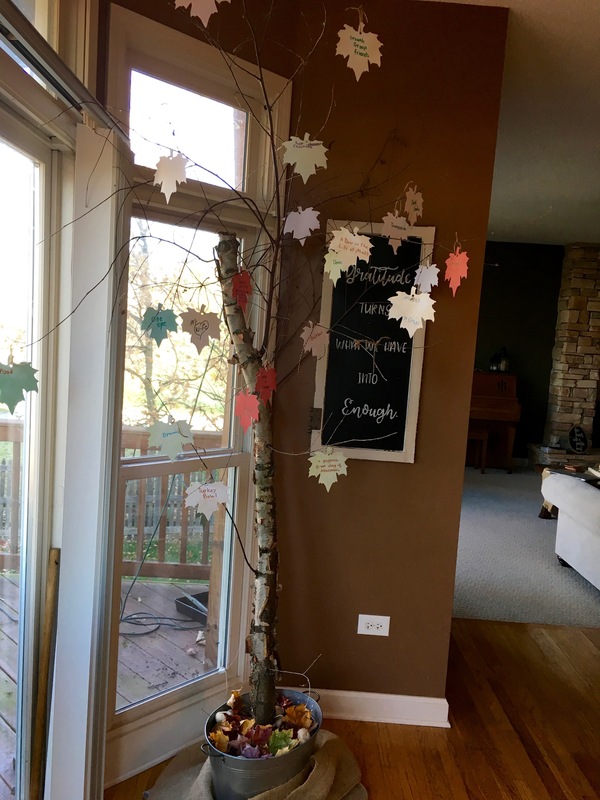 But our Thankful Tree is getting fuller. And as it does, our kitchen is full of gratitude. Thanks, Sues! I tried to look at yours but the image wasn’t loading. I’m so thankful we had that branch, and it was the perfect size!